What Sizes Do You Have Available To Hire? What Colour Are The Hire Plinths? The hire plinths are spray finished white. How Long Can I Hire Them For? 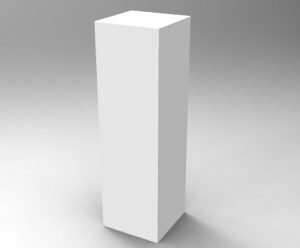 Please inform us when you call of the delivery and collection dates of the plinths when you call for your quote. Hire can be from one hour to several months. If we find that it is cheaper for you to purchase than to hire, which sometimes it is, we will advise you this at the quotation stage. Do You Have Other Client Images I Can View? The image above was taken at The Whitewater Gallery in Cornwall where we provided many plinths for the gallery refurbishment. The plinths are various sizes from 40cm to 60cm square tops and there are some glass cabinets on the left of the picture for the more precious items. This plinth pictures above is a 40cm plinth which held a wire faerie in place for a photoshoot for the makers’ website. Plinth hire is available for just 1 hour so be sure to let us know your requirements. These 30cm plinths were hired for a week in Selfridges for Shoe Designer Kobi Levi. It’s common now that you need to provide Harrods and Selfridges with data sheets for fire safety, if you need Fire Retardant plinths for hire please let us know at the outset and there is a 2-3 week manufacturing time. Sculptor Susan Long hired a range of sized plinths here for the Chelsea Flower Show. Some of these in the image were her own but as she had a larger stand she hired a few extra plinths. 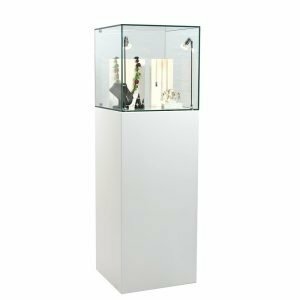 The 40cm Acrylic Case with Exhibition Plinth is now available to hire as one unit. 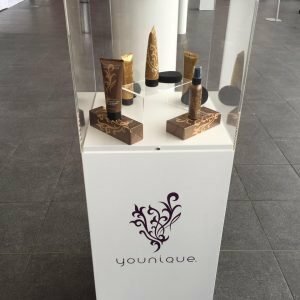 If you would like to hire display plinths, here is the contact form again, we look forward to hearing from you!